Whatever the event or occasion, your choice of award-winning branded wine and promotional champagne, will really make an impact. Finely adorned with full colour printed labels, your logo, company branding, school emblem or personal message, will make the bottle truly memorable. There's no limit to what you can have on your personalised label. Send us your artwork, photos or let our designers create something entirely unique to you. The final result is guaranteed to be of the highest quality. From just a dozen bottles to thousands, from miniatures to magnums, make a big impression with Euromarque Personalised Wines. Looking for a great gift for a birthday, anniversary, engagement or anything else? Visit our retail website, Personalised Wine Labels, for lots of ideas with personalised wine and personalised champagne. Lovely labels on wonderful wine . Promotional wine labels will add a distinctive and unique experience to your next event, the last word in themed accessories! Photos, logos, even individually named bottles! There is no restriction on what you can put on the front label. The whole bottle label is available for you to maximise the impact of your corporate branding. 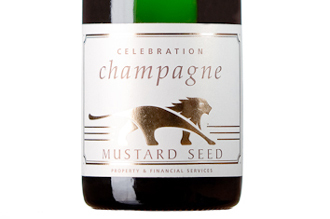 So use personalised wine and champagne labels as the ideal branded corporate gift. Send directly to individual recipients, to the venue, or your offices throughout the UK and the world! Choose from a wide range of wines and champagnes, including award winners. Directly imported from smaller growers, you get great quality at a sensible price. Looking for something specific? We are happy to source and personalise whatever else you require. Complete the gift experience with some exciting gift and presentation packaging, which can also be branded. And of course top notch postal packaging for guaranteed safe delivery. Enjoy a premium personalised champagne and personalised wine service. Award winning wine and champagne; full colour printed wine labels; and guaranteed safe delivery. 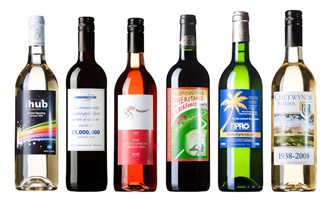 Promotional wine - the ultimate promotional gift. Your brand on the wine bottle is a memorable and welcome feature. Everyone loves to be given a bottle! Our bespoke label service makes your corporate brand stand out from the crowd. Make your business the centre of attention with Euromarque personalised Wines. Promotional wine or promotional champagne, you can have your own unique custom wine label with Euromarque, the personalised wine and champagne company. You can also see news and topical information relating to our activities on the Personalised Wine Blog.